Santa Barbara City Hall is located at 735 Anacapa Street, Santa Barbara, CA 93101; phone: 805-963-0611. Photo: Joseph and Lucy Foster Sexton House, ca. 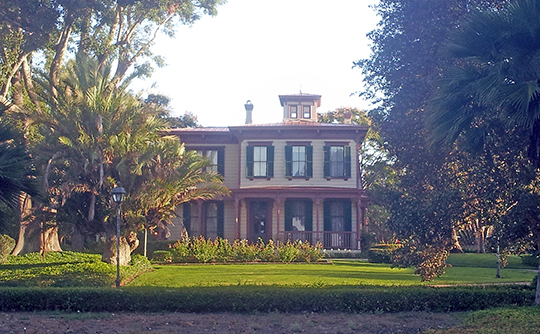 1880, 5490 Hollister Avenue, Santa Barbara, CA. Listed on the National Register of Historic Places in 1992. Photographed by User:Bzeyen (own work), 2013, [cc-by-3.0 (creativecommons.org/licenses/by/3.0)], via Wikimedia Commons, accessed November, 2016. As an American city, Santa Barbara began its legal existence on April 9, 1850, when it was incorporated by an act of the first California Legislature, although 5 months were to elapse before a wrangling Congress voted, on September 9, to admit the infant State to the Union. Word of its new status traveled slowly to the dozing channel town, where everyone felt that manana was the time to begin the necessary but dull work of instituting the new regime. Santa Barbara's earliest civil government had been established under Spanish rule in 1782, with authority vested in the comandante of the presidio. In December, 1826, Mexican rule had established the Ylustre Ayuntamiento (Illustrious City Council), which consisted of an Alcalde (mayor) and two regidores (councilmen). This governing body had full powers with the mayor acting as judge, jury and executioner. The defendant and plaintiff appeared before him, stated their cases, produced witnesses, if any, and the culprit, if doomed, was executed without delay. Unspurred by "civic consciousness," office-seeking was unknown, and the city fathers, beyond sustaining the dignity of their rank, had little to do. In the newly minted city of 1850 there was much to do. When, on August 26, 1850, the first Common Council of Santa Barbara finally convened under the presidency of Don Luis T. Burton, it had not only to formulate laws to govern the city, but even rules to govern itself. 11 days after incorporating the town of Santa Barbara, the State legislature had repealed every Spanish law but one, throwing California towns on the bleak threshold of a new era, without a straw of governmental custom to which to cling. Before the city clerk, Luis Carillo, lay a book of foolscap stitched together without a mark on it, with "Acts of the Common Council of the City of Santa Barbara" written on the cover. There was slightly less than $400 in the treasury. It was imperative that the first "Act" provide funds for carrying on the municipal government. The records of the old Council were consulted, and "An ordinance concerning licenses" went down on the foolscap as the first official act. Frugality was the keynote and taxes were light. The mayor, Don Francisco de la Guerra, acted as recorder. He drew no salary; although as police judge he received $2.00 for each conviction, he was required to pay it into the city treasury. The city clerk received $35 a month; the city marshal, $20 plus $1.00 for each arrest, and the city attorney, $10; the city treasurer, 3 percent of all money paid in, and the city tax collector, 6 percent of whatever he could collect. Since there was no printing press or newspaper, the clerk was required to draw up 2 copies of all measures, one to be posted on "the eastern corner of Luis T. Burton's house," the other "on the front of Gaspar Orena's billiard parlor." On one thing only were the city fathers prodigal. Land, which then seemed inexhaustible, sold in Carpenteria for about 25 cents an acre. Montecito values were higher at 40 to 75 cents an acre. In 1856, three city lots were sold for $1.00 each. Years were to pass before Santa Barbara possessed the dignity of a city hall; meanwhile the ambulant municipal government rented rooms in various adobe houses. Spanish alternated with English as the language of official records, appointed bodies being designated, for instance, as the "committees on gastos (expenses), propios (public property), elections and arbitrios (excise taxes)." Southern California Writers' Project of the Works Progress Administration, Santa Barbara: A Guide to the Channel City and Its Environs, Hastings House Publishers, New York, 1941.